As a manufacturer and distributor of high-quality, high-performance tubing, cable, and wire products, Whitmor/Wirenetics has over 50 years of experience serving industries as diverse as aerospace, military, entertainment, and communications. 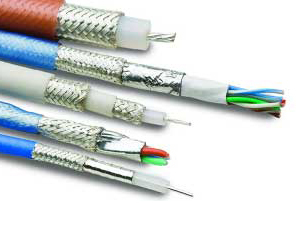 To better serve our clients' varied needs, we boast a complete line of coaxial wire and coaxial cable products, and can custom design cables to meet unique specifications. Our experienced engineering staff is always on-hand to assist with wire, cable, heat shrink tubing, and boot design solutions and can adhere to strict industry standards. For our clients in the military sector, we carry a superior line of mil spec coaxial cable to meet Mil-DTL-17 specifications. Many of our available aerospace cables meet Ethernet, 1553 Databus, Firewire, USB, and Canbus requirements, while we offer specialty coaxial, twinaxial, and quadrax configurations for space applications. Our clients who work with shipboard and rail/transit applications benefit from our low smoke and zero halogen twinaxial and quadrax cables, specially designed for their industry. And, because not all applications call for large amounts of cable, we're happy to accommodate cable lengths as low as 100 feet. Coaxial cable insulation and jackets can be composed of extruded, tape, and expanded PTFE, extruded and foamed FEP, and several types of polyethylene and PFA materials. Our conductors and shields can be manufactured from tinned-plated, silver-plated, or nickel-plated copper, as well as silver-plated high-strength copper alloys. We also work with silver-plated copper covered steel. To learn more about our coaxial cables, and which ones may be right for you, or to inquire about custom cable design assistance, please contact Whitmor/Wirenetics today.